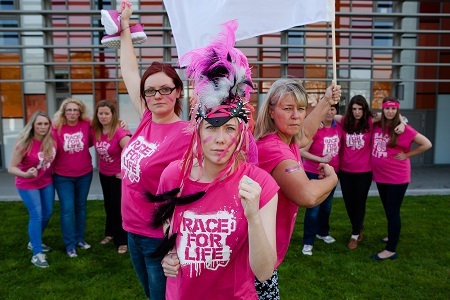 CARDIFF SCIENTISTS AND RESEARCHERS from Cancer Research UK’s Cardiff Centre put on their pink ‘war paint’ and are calling on women from across South Wales to join the fight against the disease by signing up for Cancer Research UK’s Race for Life. They want thousands of mums, daughters, grans, friends and colleagues to unite and form a ‘pink army’ at the Race for Life 5k, 10k and Pretty Muddy events at Bute Park on the weekend of 18 & 19 July. Together they also highlighted the chance to get an early taste of the power and passion of Race for Life at the charity’s ‘Battle HQ’ in St David’s Shopping Centre on Sunday 10 May from 11am. Capturing the fun and camaraderie of Race for Life, Battle HQ will give shoppers a chance to try funky face paint designs, bold tattoo transfers and nail art to get their battle look. Money raised through Race for Life allows Cancer Research UK’s doctors, nurses and scientists to advance research which is helping to save the lives of men, women and children across Wales. One of those nurses is Sian Whelan, Cancer Research UK’s Senior Nurse who works in Cardiff and other hospitals across South Wales. Sian talks to patients about participation in clinical trials and offers trial support to them and their families through the clinical trial journey. Sarah Pope, Race for Life event manager in Wales, (pictured) said: “As well as the chance to get ‘battle ready’ from head-to-toe in the spirit of Race for Life, shoppers can take a selfie to capture their ‘battle cry’ alongside friends and family in the Battle HQ photo-booth. Cancer survival rates have doubled since the 1970s and Cancer Research UK’s work has been at the heart of that progress. But more funds and more supporters are needed to bring forward the day when all cancers are cured.